Are you planning a beach wedding? Why not get the party started by inviting your guests with a Starfish Wedding invitation? Starfish wedding invitations scream beach party and let your friends and family know as soon as they open your invite exactly what they can expect on your wedding day. Even if your wedding isn't being held at the beach you can still use these cute invites for a beach themed wedding celebration. Whether you're planning a casual wedding get together at the shore or a huge beach themed wedding reception at the club, you're sure to find a Starfish wedding invitation you'll love. All of the invitations featured on this page come from Zazzle.com. Zazzle is the very best place I've found to purchase custom and personalized invitations of any kind, not just Starfish wedding invitations. Each invitaton at Zazzle is created with love by an artist, photographer or graphic designer. They feature an easy way to customize and personalize each and every card design you'll find there. I've personally shopped with them many times and can tell you that their invitations are created on high quality paper (you can choose from 6 different types) and their customer service can't be beat. Their prices are affordable and every item comes with a 100% satisfaction guarantee so you really can't go wrong. 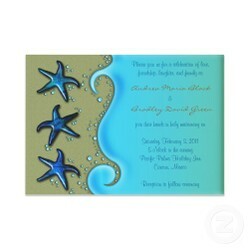 I've featured several different starfish wedding invitation styles here. I've chosen a blue theme but trust me, at Zazzle, you'll find Starfish Wedding invitations in every color of the rainbow. ps... All of the photos of starfish wedding invitations on this page are available for purchase. Click on your favorite to learn more, or to order from Zazzle.com. Starfish Beach Wedding Invitation showcases a beautiful photographic beach scene featuring two starfish laying on the sand at the water's edge. Personalize with all of your wedding information on the front and back. Paua Shell Starfish Wedding Invitations feature 3 blue starfish on the sand and a swirl of lighter blue water where you share your wedding information. Easy to personalize! Invitation measures 7" x 5"
A square wedding invitation featuring an elegant starfish on a blue background framed in a deeper shade of blue. There's plenty more wedding invitations featuring starfish and beach themes to choose from! Invitations for a nautical or beach themed wedding. Thank you for showing some of my invitations here! Nicely done. Thank you for stopping by Sylvestermouse! Wow! These invitations really are beautiful! I love the starfish on each one. Totally awesome! Wedding Invitations made from my photography is my newest project at Zazzle.